Every year, hundreds of businesses apply to win a Corporate Citizenship Award, making it one of the most prestigious awards in the field. How can you ensure your nomination stands out from all the rest? 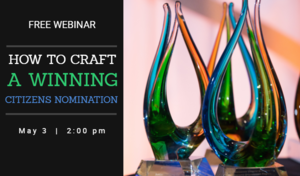 On May 3, join the Chamber Foundation for a webinar that will share tips and strategies for crafting a winning Citizens Awards nomination. The webinar will feature past judges and winners who will highlight ways to strengthen your nomination and best tell your story. From now until June 29, the U.S. Chamber Foundation is accepting nominations for the 19th Annual Corporate Citizenship Awards. Since 2000, the Citizens Awards have honored the most strategic and innovative corporate citizenship programs from businesses and chambers of all sizes.